(1) information about the query showing the simplified criteria, total hits, filters used (2) and whether the filter excluded (negative) or included (positive) certain items. The info icon (3) will display the CQL query, clicking the CQL query itself will open the CQL search and the user can modify the CQL query to make a new concordance with amended parameters. The top bar will also keep track of any actions carried out on the results. In this example, the concordance was switched to GDEX, then sorted and then a random sample was applied. The red words are clickable and allow to undo the actions. 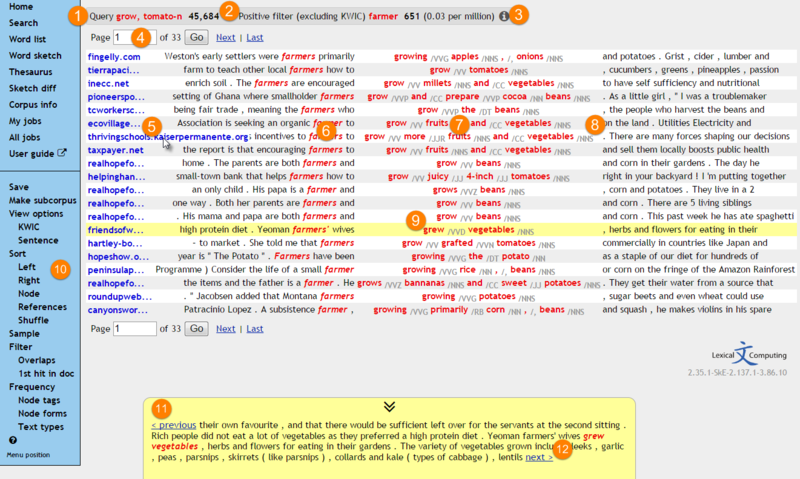 (4) Use the links to move between pages, type a page number and click Go to go to that page. (5) references – the user can select one or more types of information to be displayed, see View options. Hover your mouse to display the complete details. In this example, the user decided to display the website url of the source document. Click the reference to see more details. See the video. (7) search word or phrase, optionally additional information (8) can be displayed for each word in the query, here the user selected to display tags, see View options. (10) Various view settings can be applied to the screen using this menu. Additional filters can be applied, concordance lines can be sorted, frequencies can be calculated, the number of lines can be reduced. See View options for more information. Watch this You Tube video to learn how you can move around your concordance. Watch this short You Tube video and see how you can find out about the source document metadata in the Sketch Engine.